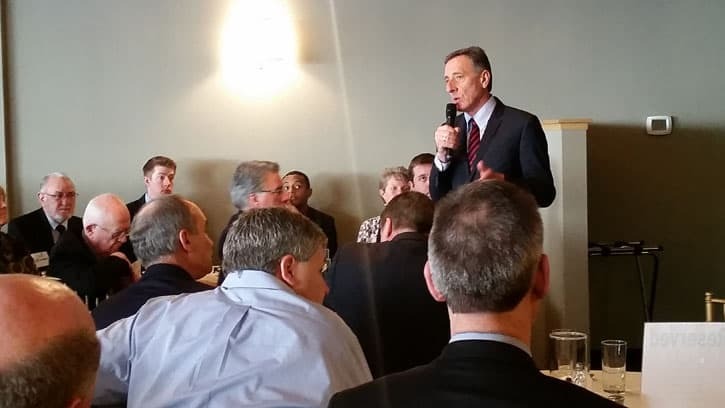 RUTLAND – Attendees of a legislative luncheon held at the Southside Steakhouse in Rutland Monday Jan. 26 were met with harsh words from Vermont Governor Peter Shumlin on how publicly-funded education and police dispatch should be reformed. Touting the state’s green energy future as promising, Shumlin quickly shifted gears to education – and how he plans to penalize small schools for not abiding by state rules he plans to enforce. “Get rid of the small schools grants and get rid of phantom students, get rid of teacher strikes. We have failed as a state to partner with local school boards and communities,” Shumlin said. Shumlin said he wants to change the formulas that have kept teachers on the job in the wake of a declining student population, bringing Vermont the title of smallest student to teacher ratio at 4.7 students for every teacher. But the state continues to have the highest per pupil spending and, Shumlin said, diverse educational options are few and far between. He said he envisions schools having to report to a state assessment team and, if they don’t abide by spending threshholds and educational progress, further action will have to be taken. “We will make you pay more for bad decisions or will actually be able to close or consolidate a school,” Shumlin said Monday. He also addressed a plan in his state budget that would merge Rutland police dispatch services with Rockingham, slashing at least 30 well-paying jobs. Rutland Senator Kevin Mullin asked Shumlin, in the wake of a severe recent loss of jobs in Rutland, from Rutland Plywood, JC Penney and other closures, to spare that move. Shumlin asked Mullin to present a different idea. Cristina Kumka is a correspondent for The Mountain Times, Cristina_kumka@yahoo.com.